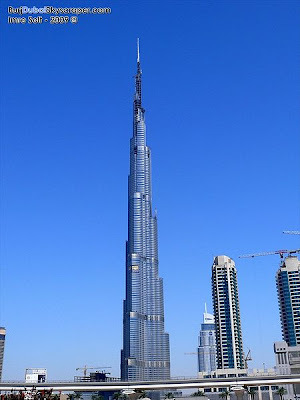 BURJ DUBAI in United Arab Emirates is the tallest building in the world. 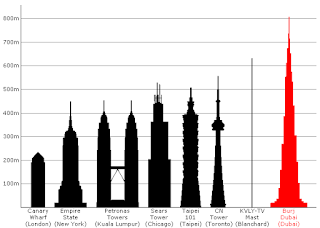 * First world's tallest structure in history that includes residential space. At 160 floors the building finally topped out on January 2009 at 2,864 feet. And it is a beautiful structure. This is a remarkable advance for mankind. Now if we can achieve commercial supersonic aviation again (alas the SST) I'll really feel as though we are advancing as a species! The building is still under construction and is expected to open September 2009. They can't build high enough or fast enough in my opinion....but this one was a giant leap for mankind :) And so gorgeous, too.